Every home enthusiast knows that a truly great garden isn’t just about planting the right flowers at the right time and watching them bloom. It’s about holistic, creative design and careful consideration of exactly how you want to use every inch of that precious green space. With that in mind, it’s time to take a look at the vertical aspects of modern garden aesthetics. With so many of us focussed on achieving an immaculate lawn, enjoying a gorgeous summer patio or filling the garden with stunning plants, it’s easy to overlook one key element of garden design – the walls that demarks this special space as yours. 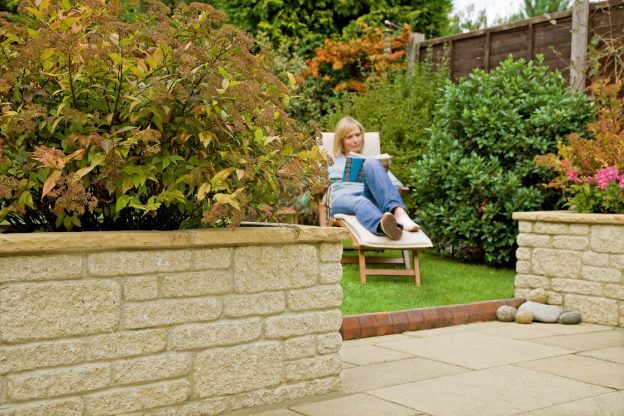 Here, we explore a few key garden wall ideas that could inspire you to create your own virtuous verticals and breathe new life into your much-loved personal paradise. A curved wall adds a subtle extra element of interest to a garden. 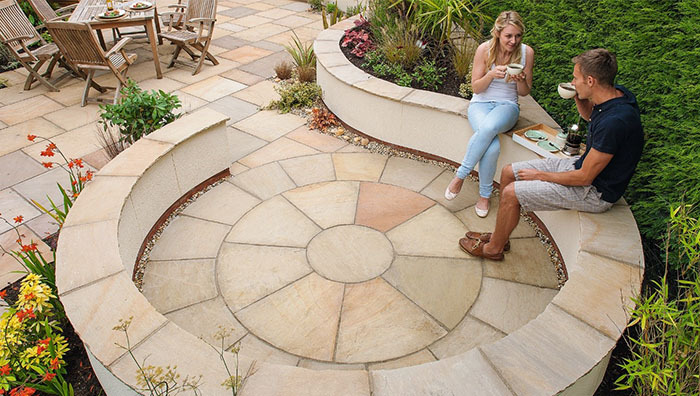 It can create a cosy nook for a private chat, like the one created with the Riven Harena Paving Circle patio feature, or provide a framework for adventurous planting. Positioned carefully, a curved wall can also work as something of a windbreak for those who live in less sheltered areas. Those with flat, rectangular suburban gardens often find a curved wall is just the thing to lift them out of the everyday to become something a little special. 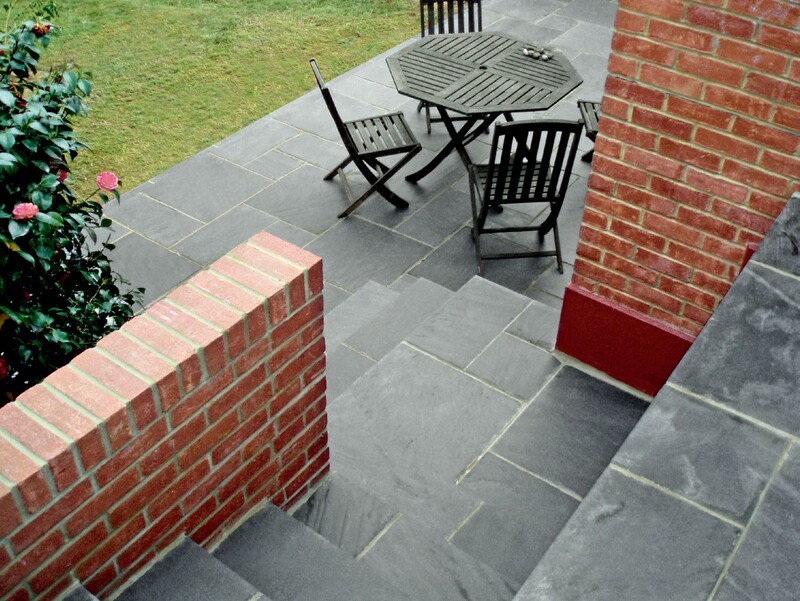 If you’re someone who likes their garden to have a polished look, copings are a great way to achieve it. Coordinated with garden walling to make a focal point of a sculpture or garden feature or used in conjunction with rustic red bricks or heritage stone, the right coping can contribute much to a garden with a more traditional feel. Caps meanwhile, which are used to top pillars and stone or brick gate posts, also lend a real sense of pride and care to a property. Many gardeners, even if they’re city folk, have a longing for the bucolic life. Drystack walling is one way to achieve this rustic effect without actually building a dry stone wall. It provides a particularly lovely setting for hip-height planting, or it could be used to soften the edges of a modernist garden. Garden wall designs that incorporate natural stone have a unique warmth about them. Increasingly, people want their gardens to be an extension of their homes. Well-chosen lights can transform an unremarkable wall into something romantic and intriguing, as well as practical. Whether you install built-in uplighters and bathe the space with a soft warm glow, use coloured neon to make a bold statement or simply string up some dainty fairy-lights, the right lighting can be incredibly evocative. 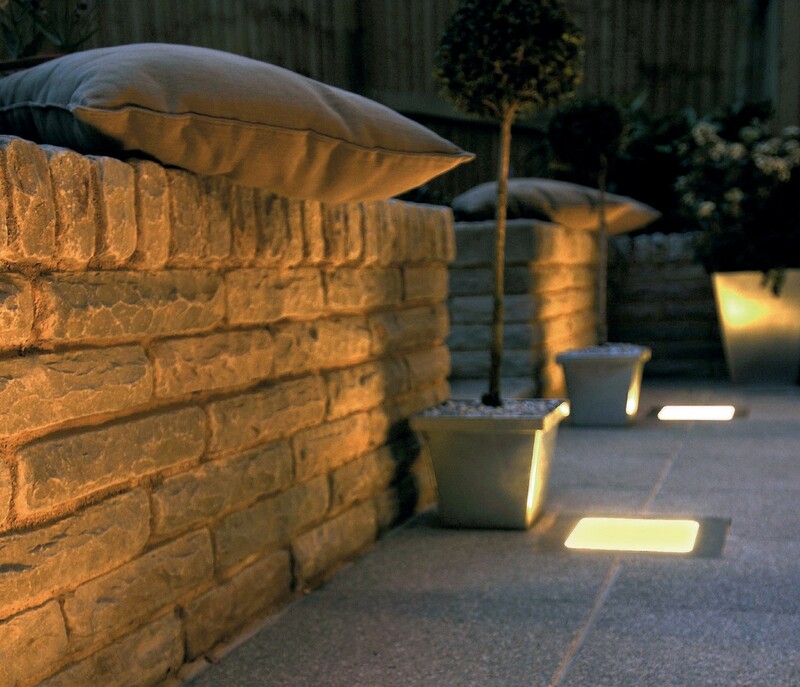 Whichever design route you take for your garden walls, clever lighting should always be part of the wider plan. A modern, multi-layered design can perform the role of primary focal point in the right garden. If you’ve an artistic eye, spend some time sketching to get the composition just right. Intricate and varied planting placed at different heights catches the eye, while also being easier on the gardener’s back. For those who have long gardens built on a slope, this type of layered wall can be a brilliant way to make those necessary steps a talking point rather than a distraction. If you’re someone who favours bold design and a slick, modern finish, contrasting materials are a clever way to achieve it. Geometric slate tiles and neat, modern red bricks are one example of this style. Tidy and easy to maintain, this red brick wall provides a good neutral starting point for architectural planting or even a contemporary sculpture. When it comes to garden walls, it can be far too easy to miss a golden opportunity. See the modest wall as having the potential for brilliance and great things can happen. Fresh thinking can take many forms. 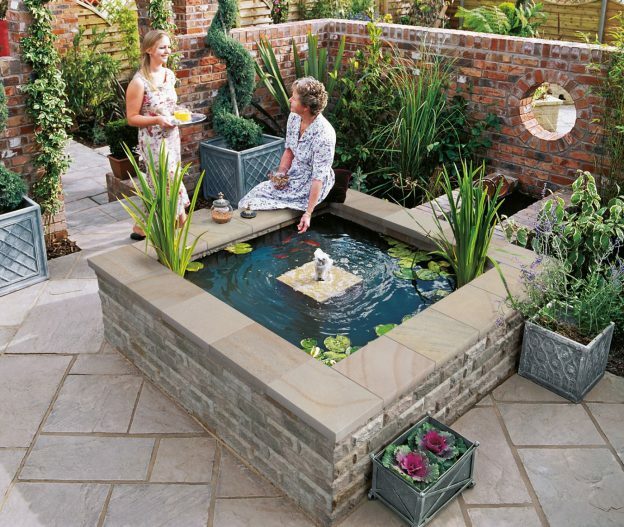 In this case it’s an water feature surrounded by Stoneface Pitched Panels in natural stone with a drystack effect, but why not a living wall throwing tendrils of foliage down to the ground; or how about a show-stealing piece of outdoor art or even a recessed nook where you can hide with a novel and a glass of wine? Of all the garden wall design ideas set out here, this is perhaps the most unconventional. The hard lines of concrete blocks are used to demark the space, while lush greenery provides a contrast in both colour and texture. 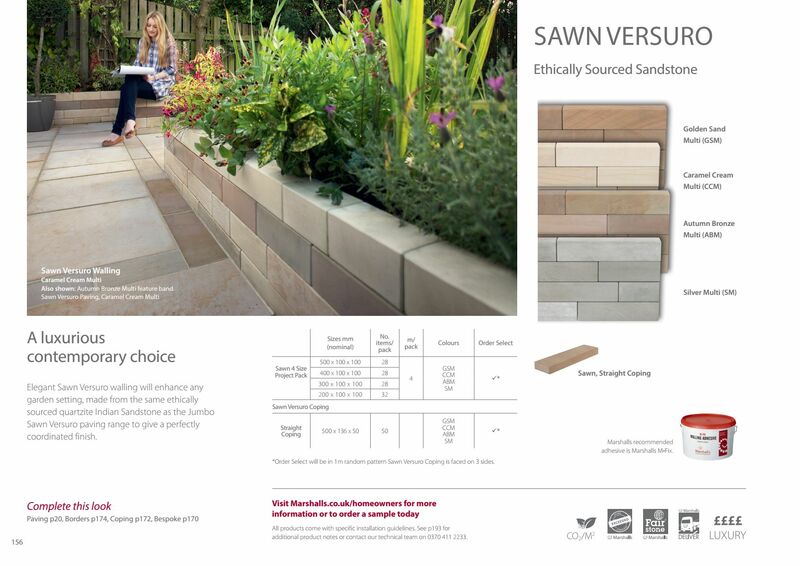 Ideal for those who like an urban, easy-to-maintain finish and want to make a lasting impression. The half wall is gaining popularity as gardeners realise its versatility. It can be used to create a permanent perimeter at ground level, with fencing then used above – giving you the ideal place to grow honeysuckle, clematis and other pretty summer creepers. Alternatively, the half-wall works within the confines of the garden if you want to build raised flowerbeds, ponds, or defined seating areas. Whether stone or brick-built, the half-wall lets you create a floorplan for your garden, setting out how each area is used. Coordinating textures and tonal colour schemes create a feeling of harmony. This is an elegant, contemporary look that many upmarket hotels and bars have been keen to replicate. It works equally well in a domestic setting, particularly if you’re someone who likes to socialise in the garden. Generous flag paving in a classic cream colour and soft stone walls in a coordinating buff hue work beautifully together to achieve a warm, welcoming ambiance, which is also exceptionally stylish. 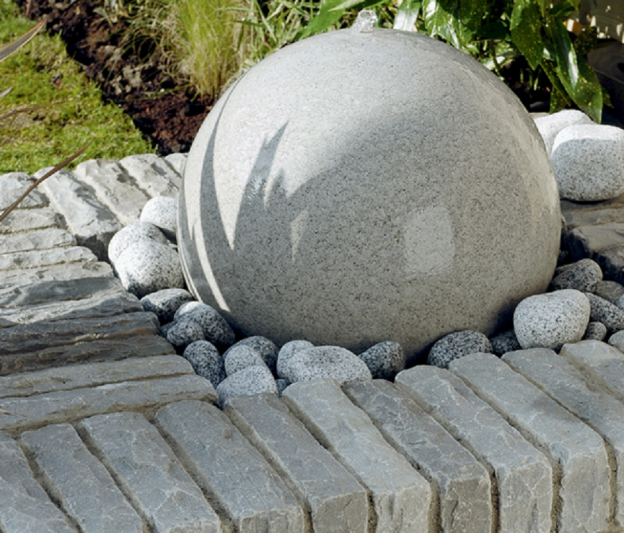 Inspired by our garden walling ideas? 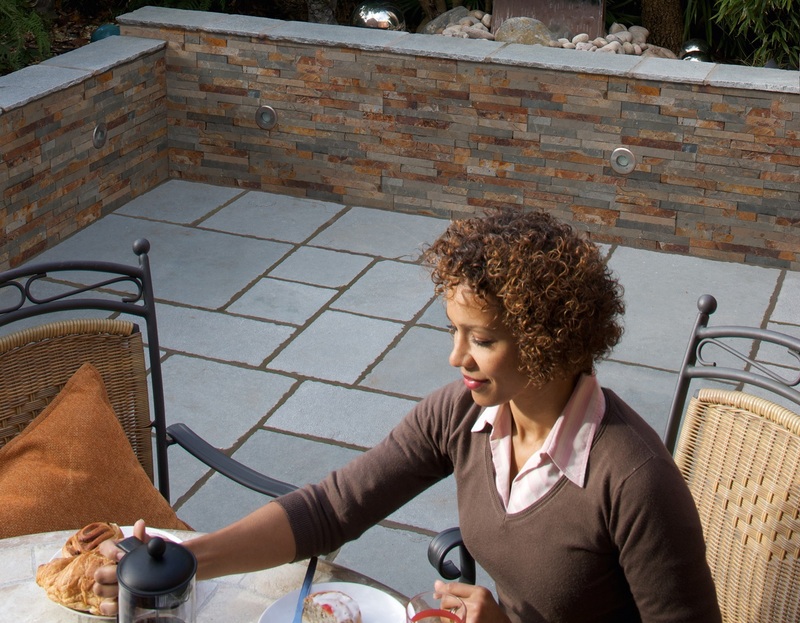 Browse the entire Marshalls range and make a feature of your garden.